Bats are intelligent, unique mammals facing multiple threats of ignorance, suspicion, poisoning, roost destruction, habitat loss, and over-exploitation. 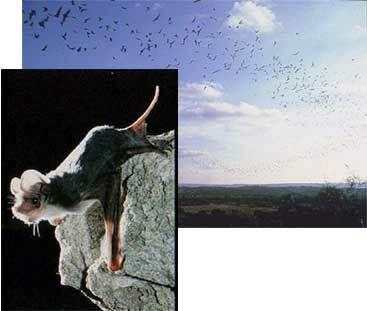 Mexican free-tailed bats (Tadarida brasiliensis) live in caves in the southern US, Central and South America. Their colonies are the largest congregations of mammals in the world. The largest colony found in (near San Antonio) has nearly 20 million bats, which eat around 250 tons of insects per night! 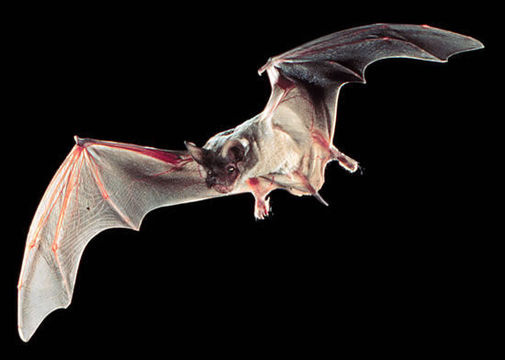 Flights like the one pictured above may travel hundreds of miles and fly to an altitude of 3,000 meters (10,000 feet or almost two miles) to feed on insects at night. Bats are the only true flying mammal and are unquestioned champions of aeronautics ... our own distant relative, the bones of a bat's wings are essentially the same design as those in human arms and hands (having a thumb and four fingers). The brain of a "flying fox" has more in common with a primate than a rodent. RESOLVED, That a copy of this resolution be prepared for Bat Conservation International as an expression of the high regard of the Legislature of the State of Texas. Free-tailed bats flying from Davis Blowout Cave, Texas - photo © William R. Elliott: Cave Life Photos - U of Texas (all rights reserved; used by permission). Close-up photo of Mexican free-tailed bat was copied on 09/19/04 from Texas Parks & Wildlife Department's Web Site: www.tpwd.state.tx.us. (all rights reserved; used by permission). Neither this website, nor the information presented on this website, is endorsed by the State of Texas or Texas Parks & Wildlife Department.